Mao Zedong's Red Army seized control of China in 1949, and the People's Republic of China was born. In 1950, China invaded Tibet and declared it to be part of China. How has Buddhism fared in Communist China and Tibet? Although Tibet and China are under the same government, I am going to discuss China and Tibet separately, because the situations in China and Tibet are not identical. Although many schools of Buddhism were born in China, today most Chinese Buddhism, especially in eastern China, is a form of Pure Land. Chan, Chinese Zen, also still attracts practitioners. Of course, Tibet is home to Tibetan Buddhism. For historical background, see Buddhism in China: The First Thousand Years and How Buddhism Came to Tibet. Mao Zedong was famously hostile to religion. In the early years of Mao Zedong's dictatorship, some monasteries and temples were converted to secular use. Others became state-operated organizations, and the priests and monks became employees of the state. These state-operated temples and monasteries tended to be in large cities and other places likely to receive foreign visitors. They were intended for show, in other words. In 1953 all of Chinese Buddhism was organized into the Buddhist Association of China. The purpose of this organization was and is to place all Buddhists under the leadership of the Communist Party so that Buddhism will support the party's agenda. It should be noted that when China brutally suppressed Tibetan Buddhism in 1959, the Buddhist Association of China fully approved the actions of the government of China. During the "Cultural Revolution" that began in 1966, Mao's Red Guards did incalculable damage to Buddhist temples and art as well as to the Chinese sangha. After Mao Zedong's death in 1976 the government of China relaxed its oppression of religion. Today Beijing is no longer antagonistic toward religion, and in fact has restored many of the temples destroyed by the Red Guard. Buddhism has made a comeback, as have other religions. However, Buddhist institutions are still controlled by the government, and the Buddhist Association of China still monitors temples and monasteries. According to Chinese government statistics, today, China and Tibet have more than 9,500 monasteries, and "168,000 monks and nuns conduct regular religious activities under the protection of national laws and regulation." The Buddhist Association of China administers 14 Buddhist academies. On the other hand, also in 2006 the Buddhist Association of China expelled a master of Huacheng Temple in Yichun city, Jianxi province, after he performed ceremonies for the benefit of the victims of the Tiananmen Square Massacre of 1989. A major restriction is that religious institution must be completely free of foreign influence. For example, Catholicism in China is under the authority of the Chinese Patriotic Catholic Association rather than the Vatican. Bishops are appointed by the government in Beijing, not by the Pope. Beijing also regulates the recognition of reborn lamas in Tibetan Buddhism. In 2007 China’s State Administration of Religious Affairs released Order No. 5, which covers “the management measures for the reincarnation of living Buddhas in Tibetan Buddhism.” No rebirths without a permit! Beijing is openly antagonistic toward His Holiness the 14th Dalai Lama -- a "foreign" influence -- and has declared that the next Dalai Lama will be chosen by the government. It's unlikely Tibetans will accept the Beijing-appointed Dalai Lama, however. 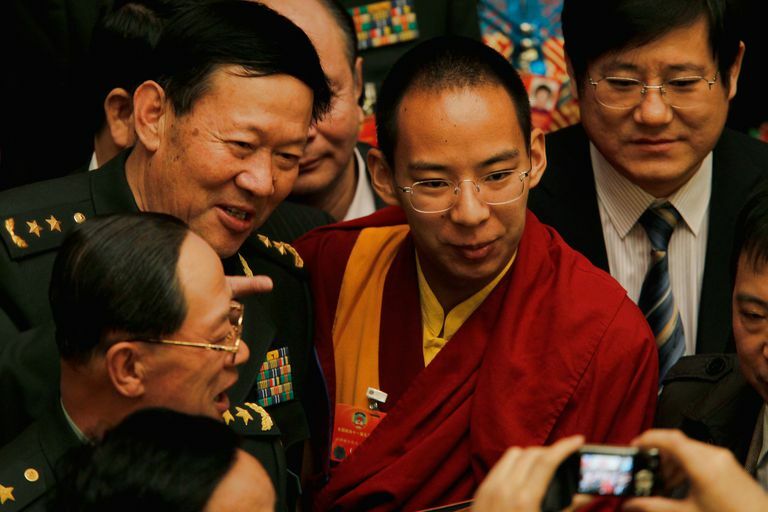 The Panchen Lama is the second highest lama of Tibetan Buddhism. In 1995 the Dalai Lama identified a six-year-old boy named Gedhun Choekyi Nyima as the 11th reincarnation of the Panchen Lama. Two days later the boy and his family were taken into Chinese custody. They have not been seen or heard from since. Beijing named another boy, Gyaltsen Norbu -- the son of a Tibetan Communist Party official -- as the 11th Panchen Lama and had him enthroned in November 1995. Raised in China, Gyaltsen Norbu was kept out of public view until 2009, when China began to market the teenage lama as the true public face of Tibetan Buddhism (as opposed to the Dalai Lama). Norbu's primary function is to issue statements praising the government of China for its wise leadership of Tibet. His occasional visits to Tibetan monasteries require heavy security. Please see "Behind the Turmoil in Tibet" for the basic historical background of the current crisis in Tibetan Buddhism. Here I want to look at Buddhism in Tibet since the March 2008 riots. As in China, the monasteries in Tibet are controlled by the government, and the monks are, in effect, government employees. China appears to favor monasteries that are lucrative tourist attractions. Monasteries frequently are visited by government agents to ensure proper behavior. Monks complain that they cannot so much as conduct a ceremony without government approval. After the March 2008 riots in Lhasa and elsewhere, Tibet was so well locked down that little verifiable news escaped. Not until June 2008, when a few foreign journalists were allowed carefully guided tours of Lhasa, did outsiders learn that large numbers of monks are missing from Lhasa. Of 1,500 or so monks from the three major monasteries of Lhasa, about 1,000 were being detained. About 500 more were simply missing. "Drepung, the largest Tibetan monastery and once home to as many as 10,000 monks, is now a reeducation camp for monks involved in the March 14 uprising. China’s state media says an 'education work group' is being conducted inside the monastery 'to restore religious order.' Up to 1,000 monks are reportedly locked inside, human-rights groups say, being retrained in line with Chinese Communist Party directives. The monastery is one of Lhasa’s taboo topics these days. Questions to locals about Drepung are typically met with a shake of the head and a wave of the hand." Monks who express dissent or refuse to 'conform' can be expelled and their residence demolished. Tulkus (reincarnate lamas) could be 'stripped of the right to hold the incarnation lineage' if they communicate with foreigners or engage in protests against the Chinese authorities - a measure that is consistent with an earlier ruling that all reincarnate lamas must have the approval of the Chinese government. In March 2009, a young monk of Kirti Monastery, Sichuan Province, attempted self-immolation in protest of China's policies. Since then, approximately 140 more self-immolations have taken place. It's true that China has invested a great deal of money into Tibet to modernize it, and that the Tibetan people overall enjoy a higher standard of living because of it. But that does not excuse the pervasive oppression of Tibetan Buddhism. Tibetans risk imprisonment merely for possessing a photograph of His Holiness the Dalai Lama. The government of China even insists on choosing the reincarnated tulkus. This is tantamount to the government of Italy muscling it's way into the Vatican and insisting on choosing the next Pope. It's outrageous. A great many reports say that younger Tibetans, including monks, are much less likely to try to compromise with China as His Holiness the Dalai Lama have tried to do. The crisis in Tibet may not always be on the front pages of newspapers, but it is not going away, and it is likely to get worse.